The following terms and definitions related to form 2290 of the HVUT should help make each year's filing process much easier. Tax professionals who are accepted into the electronic filing program are called "Authorized IRS e-file Providers." They are the Electronic Return Originators (ERO) who transmits tax return information to the IRS. The IRS itself does not provide a way to E-File Excise Taxes for Heavy Vehicle Use Tax online through the official IRS website. Taxexcise.com has been authorized by the IRS to e-file Form 2290 online. It is a secure site and is recommended directly from the IRS website. The tax period for heavy highway vehicles begins on July 1 and ends on June 30 of the next year. The filing period is expected to be July 1 through August 31. If there are any changes to when heavy vehicle tax is filed, we will inform you. 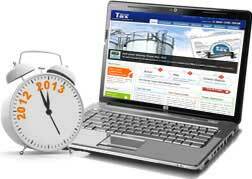 Please set up an account, including your email address, to receive communications from taxexcise.com. A Vehicle is considered to be a taxable vehicle if it was operating on public roads between the tax period of July through June. A vehicle is also considered to be taxable if it has a taxable gross weight of at least 55,000 pounds and travels at least 5,000 miles during the tax period (7,500 miles if used for agriculture). Highway motor vehicles that have a taxable gross weight of 55,000 pounds or more are taxable. A highway motor vehicle includes any self-propelled vehicle designed to carry a load over public highways, whether or not also designed to perform other functions. Examples of vehicles that are designed to carry a load over public highways include trucks, truck tractors, and buses. Generally, vans, pickup trucks, panel trucks, and similar trucks are not subject to this tax because they have a taxable gross weight less than 55,000 pounds. A vehicle consists of a chassis, or a chassis and body, but does not include the load. It does not matter if the vehicle is designed to perform a highway transportation function for only a particular type of load, such as passengers, furnishings, and personal effects (as in a house, office, or utility trailer), or a special kind of cargo, goods, supplies, or materials. It does not matter if machinery or equipment is specially designed (and permanently mounted) to perform some off-highway task unrelated to highway transportation except to the extent discussed below under Vehicles not considered highway motor vehicles. A Vehicle is considered to be a suspended vehicle if it travels less than 5,000 miles during the tax period. There is a special exemption for vehicles used exclusively for agricultural purposes. Agricultural vehicles (also known as Farm Use vehicles) may also be considered to be exempt if they travel less than 7,500miles during the tax period. The First Use Month of a vehicle is the month in which the vehicle was first placed in service during the tax year. In the case of a vehicle that has been used continuously, the First Use Month would be July because that is the First month of the tax period. If a new vehicle has been placed in service between the months of July and June, the tax amount will be prorated based on the number of months the vehicle was used during the tax period.